There’s a timelessness to A Chinese Ghost Story. Sure, it has stop motion skeletons, 1980s synthesizer music and a Taoist monk who sing/rap fights, but there’s something about love stories that never go out of fashion. A Chinese Ghost Story is a love story. Sure, it’s also a fantasy bedtime story with spooky spirits and sweet puppets, but it never loses sight of the love, and that’s what’s most important in a story like this. Puppets are a close second though. This tale begins with Ning Choi-san (Leslie Cheung), a meek debt collector whose inability to confront others has left him nearly destitute. Watching this I never thought I’d relate this much to a Chinese Qing Dynasty era debt collector. Ning travels to a rural village and after again failing to collect a debt, spends the night in an old temple. There Ning meets a beautiful woman named Nip Siu-sin (Joey Wong) and instantly falls for her, but the next day she’s gone. 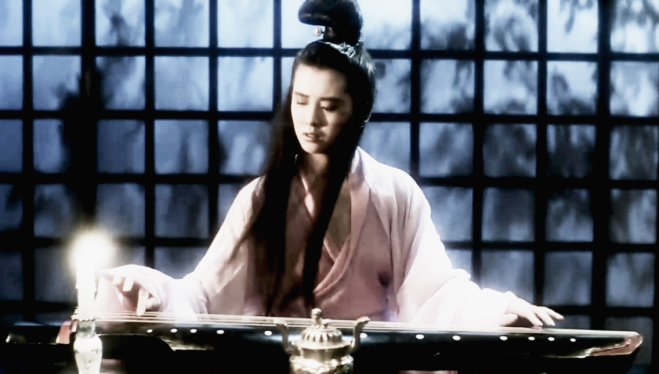 Ning meets a Taoist mystic swordsman named Yin Chik-ha (Wu Ma) and tells him about the woman. Yin knows about the temple and tells Ning the woman he loves is a ghost. Additionally, he says the woman (being a ghost) can only show herself at night and if caught in the sunlight will vanish. Got to get those ghost rules established, that’s smart. Ning goes back to confirm this theory where this time he encounters more than the beautiful woman. Yep, stop motion skeletons. I knew it! Eventually, Ning meets with Nip again and learns her spirit has been imprisoned in the temple by a Tree Demoness (Lau Siu-ming) and she can only be free if her ashes by the temple are dug up and buried somewhere else. The Tree Demonness catches word of Nip’s relationship to Ning and responds by taking Nip down to the underworld. Ning, refusing to give up, asks Yin to travel with him to the underworld and fight skeletons and sweet tree puppet things. Trust me, it sounds a lot cooler than I’m making it sound. A Chinese Ghost Story almost has a Disney vibe to it; the music, the humor, the quirky characters, the everything… Except for the blood sprays and decapitations. Maybe it’s more like if Disney had made The Evil Dead. It’s kind of a weird vibe, which leads into my complaints. First, the ending to the film feels abrupt and second, the film’s plot wanders. The overlying narrative is good, but from scene to scene the film is a mess. It’s like if you were to trim away all the fancy stunts and effects, what would you have? You’d have the fun characters, but nothing for them to do. They are driven by important emotions, but not much is built upon those emotions. Regardless, I wish more films for Shocktober were this fun instead of depressing and disturbing. I had a good time with this one. Check it out if you like to laugh. If anything, at least watch the fight-rap part, it will make your world a better place.